A Royal Regency Romance Novella Serial suitable for all ages. Lady Matilda Dartmount has just celebrated her first Christmas since the fire—her first Christmas without her parents, the Marquis and Marchioness of Dartmount. (In Just One Christmas Kiss) She only has her little brother Clarence and her dour Aunt Alda as family. But shortly before Christmas Eve she met the new Lord Barrington. Uninitiated in the ways of the Ton, he is shy and unassuming, with a slight stutter in company, but has an inner strength that attracts Matilda. Under the mistletoe on Christmas Eve, a new love blooms. Aunt Alda is determined that her niece will marry well, and a second rate Lord, who only just acquired the title, and lacks for social skills is simply not good enough. She thinks that Lord Phillips is a better choice. In fact, she thinks most anyone is a better choice. Luckily, Aunt Alda won’t know who is under the mask, at the New Year’s Masquerade. 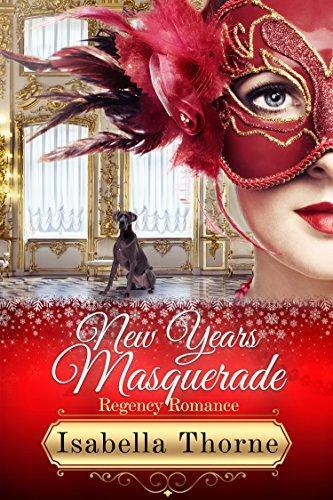 New Year's Masquerade is a Regency Romance set in 1811-1820 and is marked by witty banter, balls, hunts and country house parties, much like Jane Austen's famous Pride and Prejudice. New Year's Masquerade is book 2 in the Mistletoe and Masquerade 2-in-1 Collection. Sign up for her newsletter to receive a FREE STORY and to be notified of the debut of Isabella Thorne’s next book.